It’s three weeks to the day since I arrived on St Croix, beaten down from 30+ hours of flights and airports, feeling that it would take weeks to recover from such an ordeal. However, recovery of that nature was not to be, and instead I’ve been ever so hard at work. I’ve cleared my home site, trimmed the tree above it, re-cleared the site, staked out the foundation, and dug nearly halfway around the perimeter where the foundation wall will sit. But that is all for another post, another day. 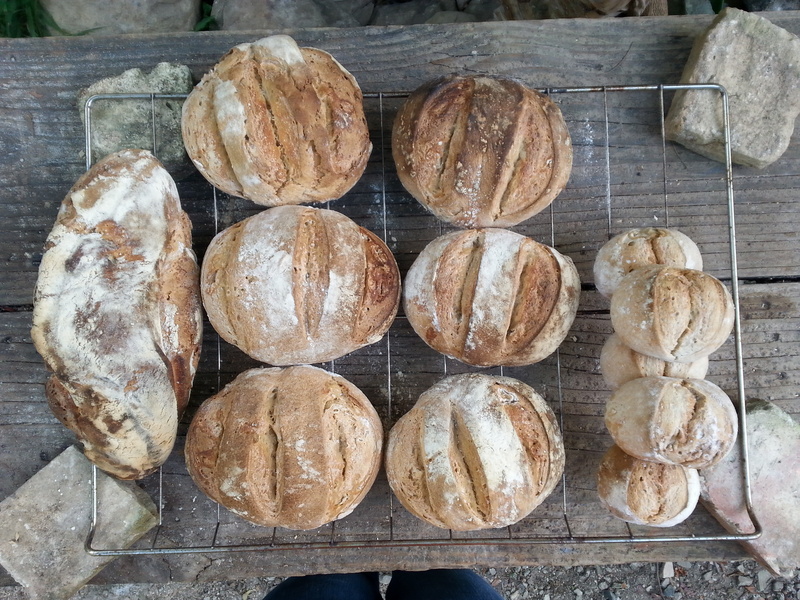 For today has been a big, exciting day, on which I built from the previous experimentation with the bread oven, and baked a real, production-size batch of sourdough bread in our home-built, wood-fired oven! 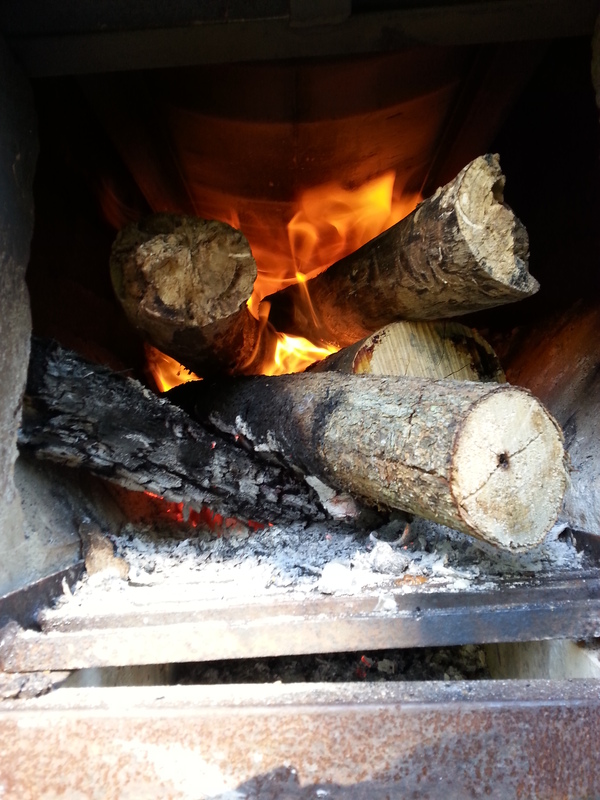 The last test run of the oven was very successful, reaching a temperature of 500deg F in a relatively short time. 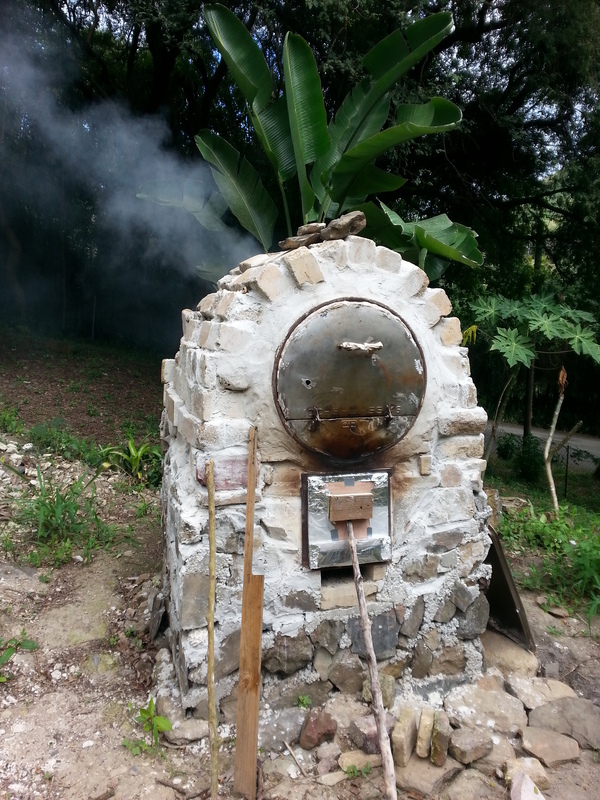 This was achieved by decreasing the airflow into the firebox (the underneath of the oven where there fire is built), thereby trapping the hot air and giving it more time to heat the barrel (cooking chamber) before escaping out the chimney in the rear of the oven. I was able to successfully bake a loaf of banana bread and a small batch of sourdough, over the course of about 1.5hours. This time around I made enough dough for about a dozen small loaves (or eight regular loaves), which I split into loaves and rolls. The dough was a basic wholewheat, which is reliable and easy to handle, a good choice for while I’m still figuring out the finer points of the oven. To give you an idea of volume, this batch was about 20cups, or about 8lbs of flour. 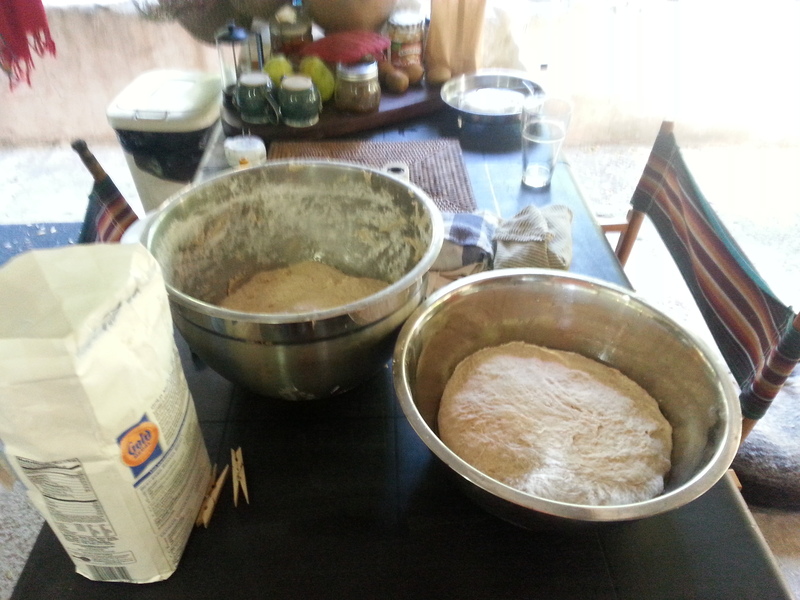 That’s a lot of dough to knead, so I was thankful for the great workout I’ve been getting from clearing and digging! It was also ever so wonderful to spoon some homemade boston beans onto slices of fresh-out-the-oven sourdough wholewheat bread for a delicious and easy dinner! 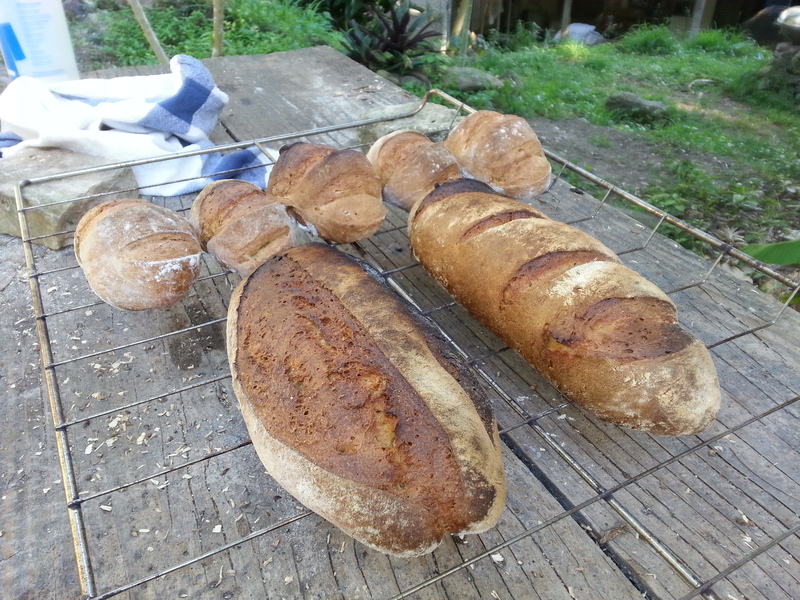 Due to the success of this batch of sourdough and the oven, I shall soon be accepting local orders for weekly baking, the proceeds of which will go towards the Nid tiny house and sustainable living project. 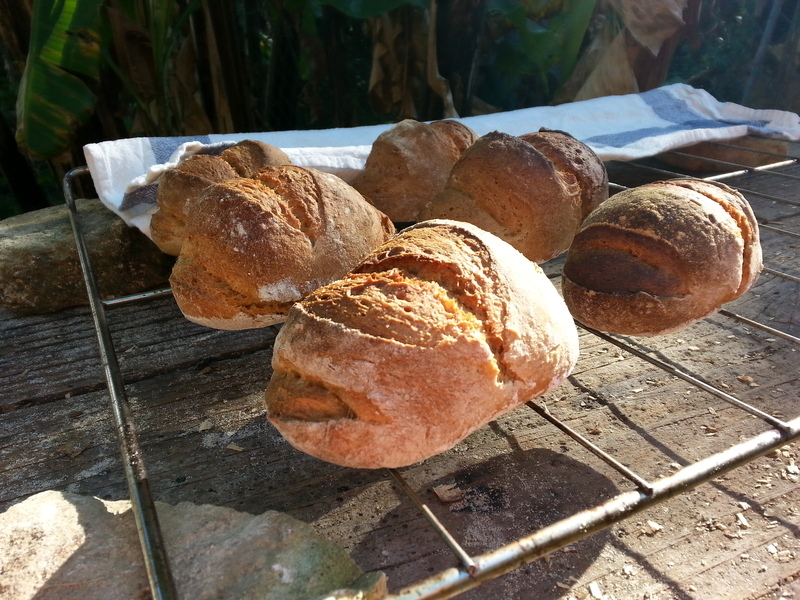 Please check back soon on the Nidulari homepage for a new “products and produce” tab, which will include an online pre-order form for the bread, as well as listings of any excess produce from the garden and orchard. Hi Rebekah – yes on both counts. I’m back on St Croix for a minimum of two years, could be forever, depends how things go. 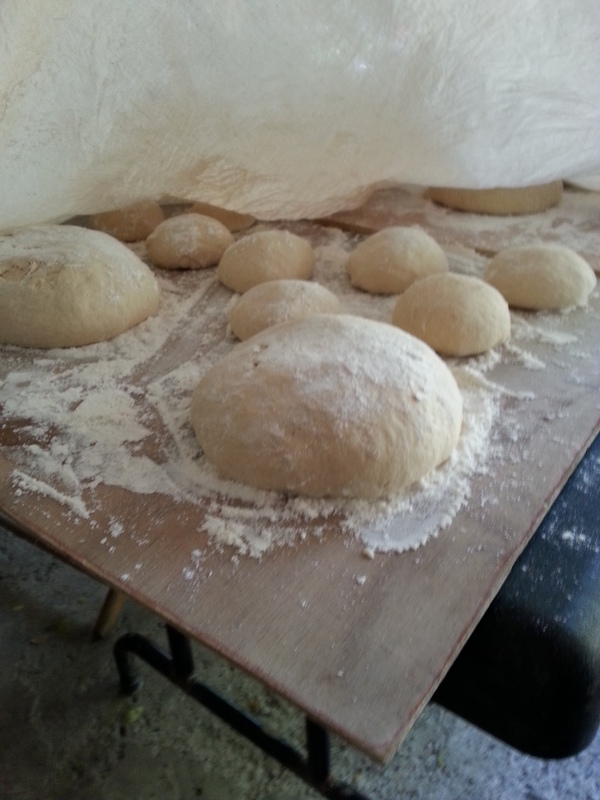 The crusty loaves are no problem in the humidity, I just have to make the dough a touch drier than up north. 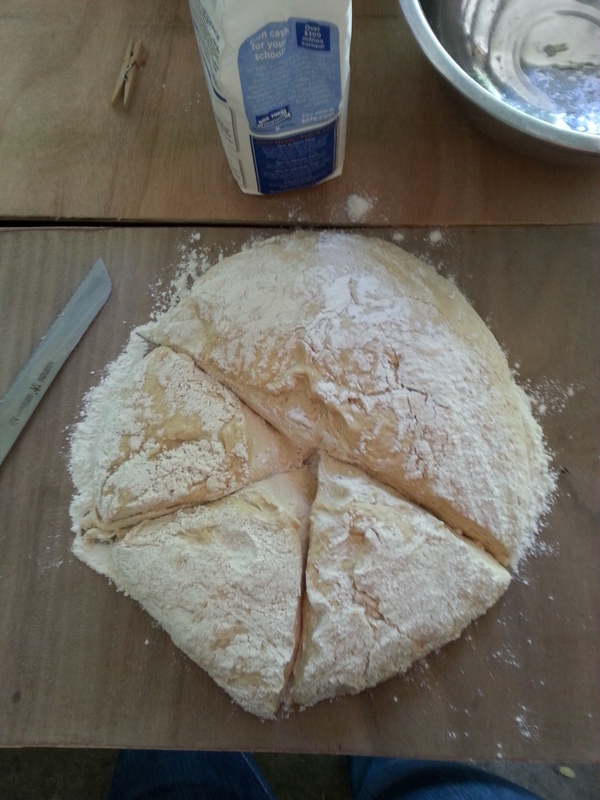 Mostly that’s to counteract spread, the crust mostly just depends on a really hot oven! Thanks, Diana! Will look forward to seeing you sometime! I ordered two loaves of the whole wheat bread to pick up at noon on Sat. I am not sure if the order went through can you please check and if you already have an order then please disregard this email. Thank you look forward to meeting you on Saturday. Hi Diana, your order had not come through, so thank you for checking! 2 wheat loaves it is. For future reference, you should recieve a confirmation email if your order does go through. Thanks, and see you on Saturday. Thank you, looking forward to the bread and meeting the adventurous you. I admire your courage.